The University of Arizona has brought video and animation relating to the Phoenix Mars Mission onto iTunes U, the education-focused portal hosted on Apple's iTunes. U Arizona is the lead on the mission, the first in a NASA program aimed at launching smaller missions to Mars designed to complement larger ones. With the Phoenix mission, U Arizona became the first public university to take the lead role in a mission to Mars. Launched Aug. 4, 2007, with touchdown by the Phoenix Mars Lander on Mars's surface May 25, 2008, the mission will investigate water ice believed to be buried just beneath the surface in Mars's northern arctic plains in a region called Vastitas Borealis at 68 degrees north latitude, 234 degrees east longitude. (The mission's team released an image June 2 of Martian soil captured in a test by the lander's robotic arm scoop showing small white patches that could be ice or salt.) The aim is to explore whether the Martian arctic can--or used to be able to--support life. It's also studying the history of water at the landing site and exploring how polar dynamics affect the planet's climate. The project is overseen by Principal Investigator Peter Smith of the university's Lunar and Planetary Laboratory in the Department of Planetary Sciences. The project is also managed by Barry Goldstein at NASA's Jet Propulsion Laboratory and Ed Sedivy of Lockheed Martin Space Systems Co. A wide range of academic and other institutions are involved in the project as well. A list can be found here. While a wide range of still images, videos and animations are available through U Arizona's Phoenix Mars Mission Web site, the iTunes U portal provides 38 clips (as of this writing) ranging from a minute or so up to more than 47 minutes with taped press conferences, mini-documentaries, and other video materials. All of the materials are available free, and users can subscribe to feeds housed in individual categories. 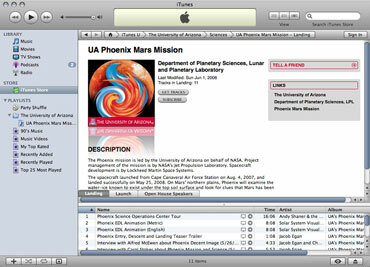 U Arizona's Phoenix Mars Mission sub-portal on iTunes U can be found here. The Phoenix Mars Mission is also providing educational content related to the mission, including lesson plans, activities, and multimedia aimed at grades 3 through 12. An education overview can be found here. Lesson plans and activities can be found on the Phoenix Classroom site here.